The Cabot Trail is probably the most revered area of Nova Scotia, in terms of beauty, but we saw none of it. This would have been more disappointing if we hadn’t been to the Gaspe Peninsula, which is often discussed as being comparable but less developed and in French, or if the weather had been less drizzly. The thing was we needed to be on a boat on July 23, so we just didn’t have time. 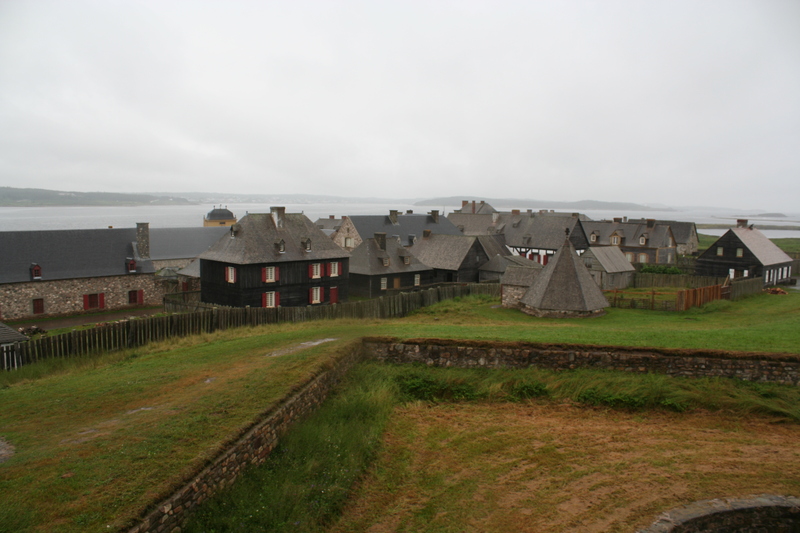 What we did have time for was the Fortress of Louisbourg. 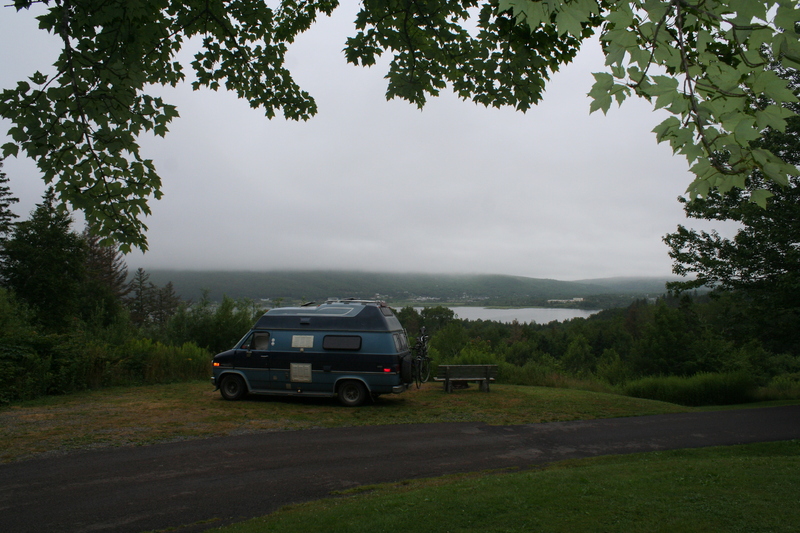 (We also did have time to spend the night in a very nice park: Wycocomagh Provincial Park, which seemed oddly empty). The next day, on our way to Louisbourg, we visited Lick-a-Chick, the roadside chicken stand famous for what should be an obvious reason. We went there not for chicken, but in the hopes that they would have merchandise, which they did. A lot of merchandise. Step bought a T-shirt AND a toque, (to, you know, support the cause and promote an activity we both like). I didn’t buy anything because I already get mistaken for a Lesbian too much of the time. The Fortress of Louisbourg was originally built by the French, but then the English got it, then the French got it back, then the English got it. I guess the Canadians ended up with it in the end, but by then it had been completely razed by, I think, the English so there wasn’t actually any fortress left. When the cod fishery collapsed in the ‘90’s, the Nova Scotian government decided to recreate the Fortress with the original plans which they got from France, and make a “living museum” with people there wearing period costumes and living accurately the lives of people of the past. So they retrained the out-of-employment fishery workers new skills, and now they will always be able to find work as blacksmiths and musket wielding soldier guards and never have to be out of work again. Anyway, it was a huge fortress and only parts of it have been rebuilt, but more than enough to get the idea, and actually so much that it is the largest historic reconstruction in North America, and when you visit you can wander around at will and check out different stuff. At Louisbourg there are bakeries and 3 different restaurants you can dine at; an inn for the wealthy with cutlery and roast beef and stuff; a middle class inn with a set menu where you just get one big pewter spoon and a giant linen napkin to eat with; and a lower class eatery where you get a hunk of bread and maybe some cheese. 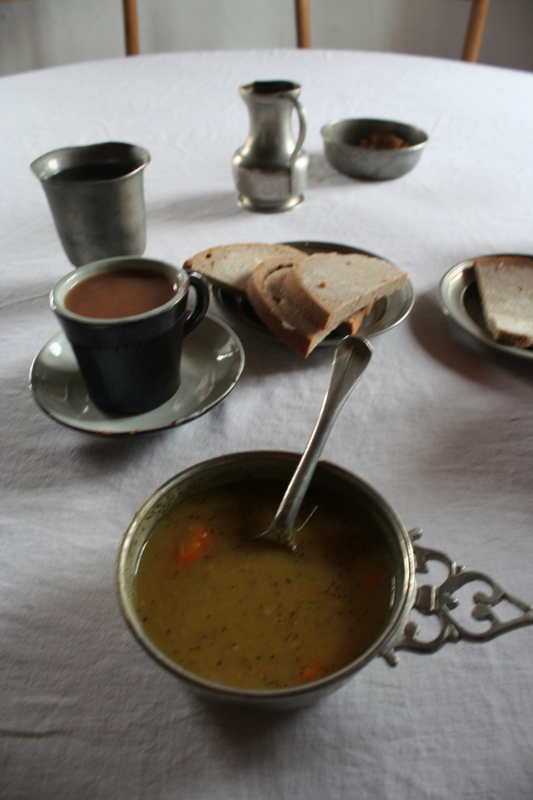 We ate at the middle class inn, and had some pea soup, fried cod and turnips and carrots. We also got slices of the 3 different classes of bread, getting coarser as the economic condition of the class went downwards. Lunch was quite good. I was thrilled to receive carrots and turnips, as this is a combination I have only eaten at Christmas and Thanksgiving in the past. (Ha! Little did I know that carrot and turnips are standard fare of the east coast, tiresomely so, and by the time we headed west again almost all I could think about was having some fresh broccoli). Alas, while the food, décor and service were faithful to the 18th century, the prices were 2008 all the way, but still reasonable. Which was just as well, I suppose, as we had no Gold Louise or Playing Cards to pay the bill with, anyway. 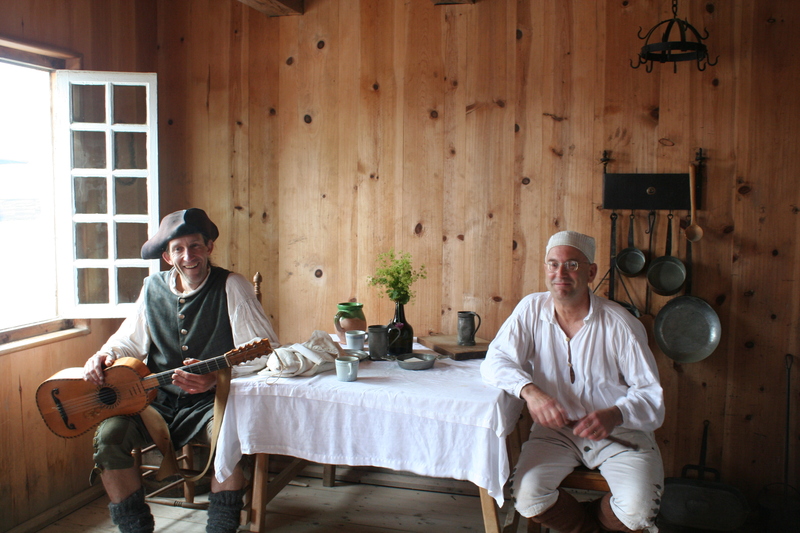 The stories of Louisbourg were quite interesting. 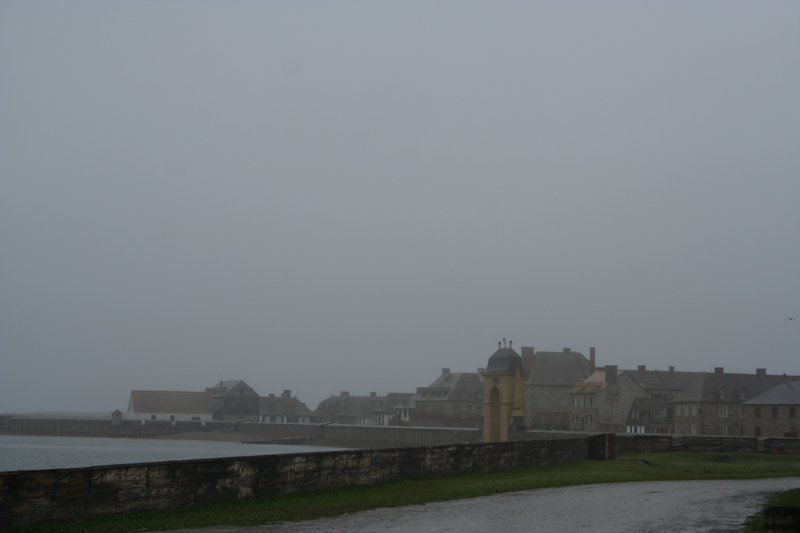 We commented on the dreary foggy and damp weather, and were informed this weather was one of the main reasons that the French had chosen the location for the fortress, since the British would have a hard time finding it in the gloom. There were a couple of reasons the French kept losing the fortress to the British. One was because they heavily armed and guarded the side facing the sea, but left the land facing side almost totally open, so of course the British attacked by land. How did the British know that land was the bigger-than-life Achilles heel of Louisbourg? Because captured British Officers were free to keep their swords and wander the fortress by day, having only to report to their cells at night, so when they were traded back to the British in exchange for French prisoners they had loads of tactical information to report to their officers. Yes, the French’s other downfall was giving their enemies with too much dignity. I asked one of the soldiers why there was a pointy backed wooden horse on the yard of the Governor’s Mansion and she (she! Not exactly historically accurate, but this really is 2008) told me when soldiers went bad their hands were tied behind their backs and they were made to sit in this wooden pony for an allotted amount of punishment time. Ah, the Sado-Masochism of the frontier times. Of course we had arrived quite late and caught one of the last shuttles back to the interpretive centre, where we were parked. Our next task was to drive to North Sydney, where we would catch an early morning ferry to Argentia, Newfoundland. It wasn’t that far and we were in the opposite of a hurry, so we drove in a pokey manner, and on the way we went through Sydney, home of North Americas largest most toxic tar pit. I would have actually liked to see this tar pit, but we didn’t know how or where (there’s not exactly a lot of signage directing you to the toxic sludge pool) and it was darkish. We filled up on propane, (the first east coast place I heard with my own ears someone saying “Wha?”), and then spent a good hour looking for the Legion, where we imagined there might be karaoke or something else good. It started raining like crazy, and we never found the Legion. Eventually we parked in a supermarket parking lot and fried a dinner of sausage and fresh green peas bought in Wolfville. We were trying to get to the ferry terminal late enough that we could sleep in the van while we waited for the ferry. We did get there around 11ish, but there were ferries ahead of ours and the lots were full until after 1. Thankfully, a very nice employee told us about a nearby wee lot where we could “park” while we were “waiting”, and we went there and spent the night. The ferry terminal near Sydney, I would like to say, is quite nice, with TV lounges, a bar, a cafeteria, and free showers in the washroom for the dusty traveler. Sue and John were on a fishing trip with their kids, but they had left a key for us and they had a nice flat driveway for the Boogie Bus. We changed into clothes a little nicer and went downtown to meet an old friend of Step’s, Micheal, and his fiance Kim, for Saturday night in Halifax. 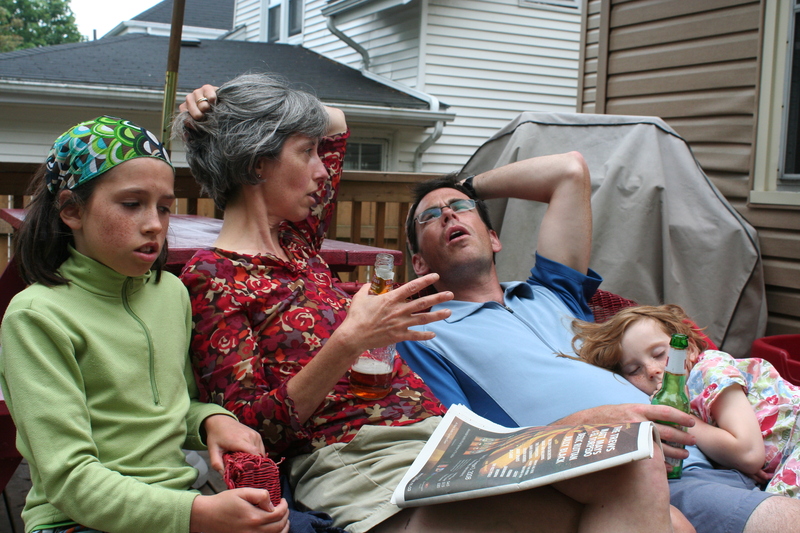 The rumours are all true: Halifax sure likes to party. We met them at a kind of yuppie tapas-like bar called Mosaic which looked good and was crowded, but had terrible service. Kim kept saying the bathrooms were really nice, and when I finally used one it was nice, with little square tiles and a glass sink, but nothing to write home about. When I later saw the bathrooms at the dance club we went to, Reflections Cabaret, I thought maybe it was all relative, because in their bathroom the floor was actually muddy, there was no way you wouldn’t have to squat, and the cold water taps had been removed I guess because of so many people doing E and only drinking water so they could at least have to buy it. Step’s beer was cheap but my soda water was 4 dollars. I don’t mean to be down on Reflections Cabaret—I hardly ever go to dance clubs so as far as I know those are standard conditions. The people were nice and the music was good, and I enjoyed their dress code which was only “No Sports Jerseys”. I also enjoyed hanging out with Michael and Kim—good peops who like a good party night. Halifax downtown was super-hopping, with tons of people on the streets. All the girls were really dressed up so I was glad I had taken off my T-Shirt and put on a dress, at least (I find it hard to drum up an interest in “girl” clothes). At around 3 in the morning we went to a “pizza” place and got some Halifax donairs, then a cab. We got a cab pretty quickly, which it turned out was beginner’s luck, because there is a big shortage of cab licenses in Halifax, just like Vancouver, and their bus system isn’t that good either, just like Vancouver. 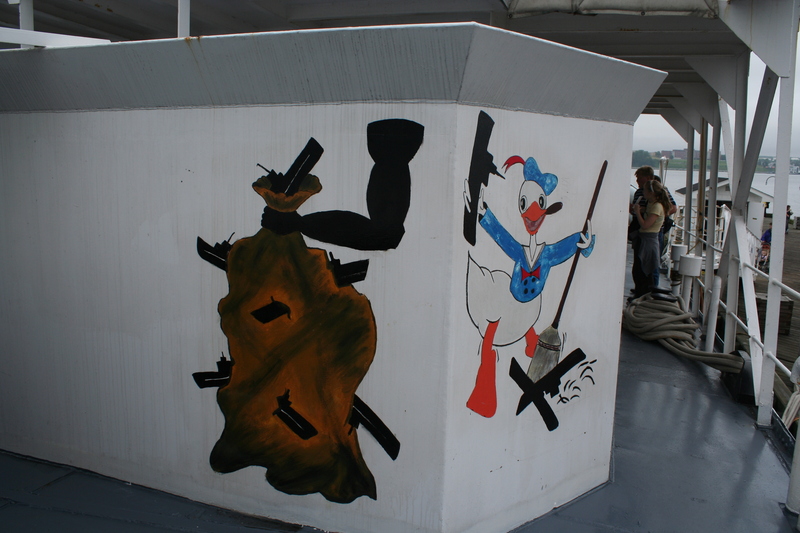 Get it together, Canadian port cities! In these days of eco-concern, why have the best option be driving your car? At least in Vancouver you can ride a bike but Halifax has extreme hills. The next day the Sue and John family came home and we hung out a bit, then Step and I went back downtown and ate at the Wooden Monkey, which is one of those restaurants which focus on local suppliers and bio-dynamically farmed foods. It’s always the same story: doubt that such a business is viable, then having it be a huge success because, it turns out, people want to eat local and seasonal. I had a lamb burger with goat cheese with mint in it. It was really good and I will someday try minting some goat cheese at home. Afterwards we went to Ginger’s Tavern, because every Sunday they have an improv group “Picnicface”. I have really seen an inordinate amount of improv in Vancouver, and have gotten Step interested in it, as well, and so we are always keen to see what’s going on in other towns. It happened that this night YTV had sent a scout so the usual night had been turned into a “showcase” with a few stand-ups and visiting improv troupes. It was really busy but some two guy shared their table with us so we didn’t have to stand in the aisle. Step bought them a beer and one of them was bowled over by this because the beer cost 6 dollars. Ha! 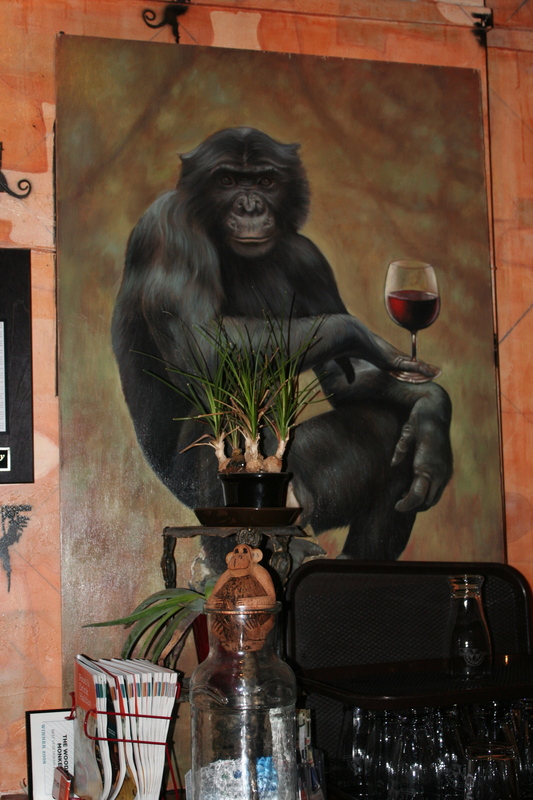 He would be distraught to drink in Vancouver. Anyway, most of the entertainment was good, very good; we love Picnicface! When we got back to Sue and John’s Sue was up and had a bunch of bottles of Russian vodka with different flavours for us to try. I could only have sips but I liked the birch one. The next day we went downtown and explored the waterfront a bit. 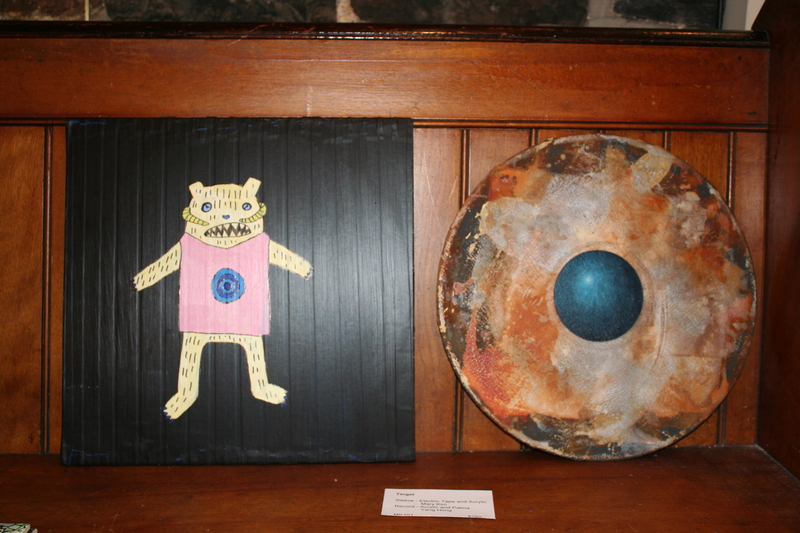 We checked out Argyle Fine Arts who had a show of paintings on vinyl records. We’re not really souvenir buying types and hadn’t bought much across Canada so we didn’t feel guilty when we bought 2. One was a “break-out” painting by Lindsay Hicks, who apparently usually sells seascapes and the like by the boardwalk, and the other was a collaboration by Mary Kim and Yang Hong. Yang Hong is from Vancouver. Ironic! 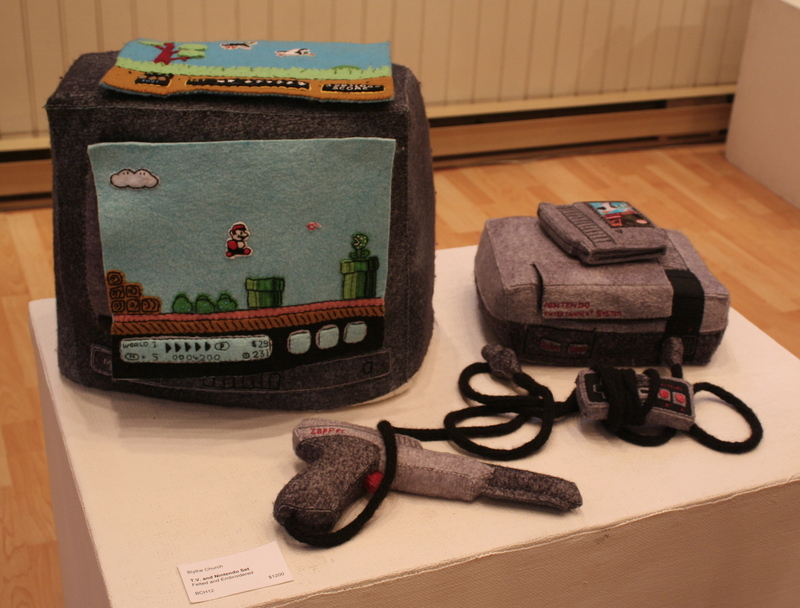 Another thing we liked was a felt Nintendo Entertainment System with Mario and Duck Hunt by Blythe Church. I am a Nintendo enthusiast and we were recently given an NES by our friend Daniel (thanks, Daniel!). We couldn’t buy Blythe Church’s felt version because it cost too much for us, but we enjoyed seeing it. There was a bunch of other stuff by Blythe Church, like felt guitars and dolls. 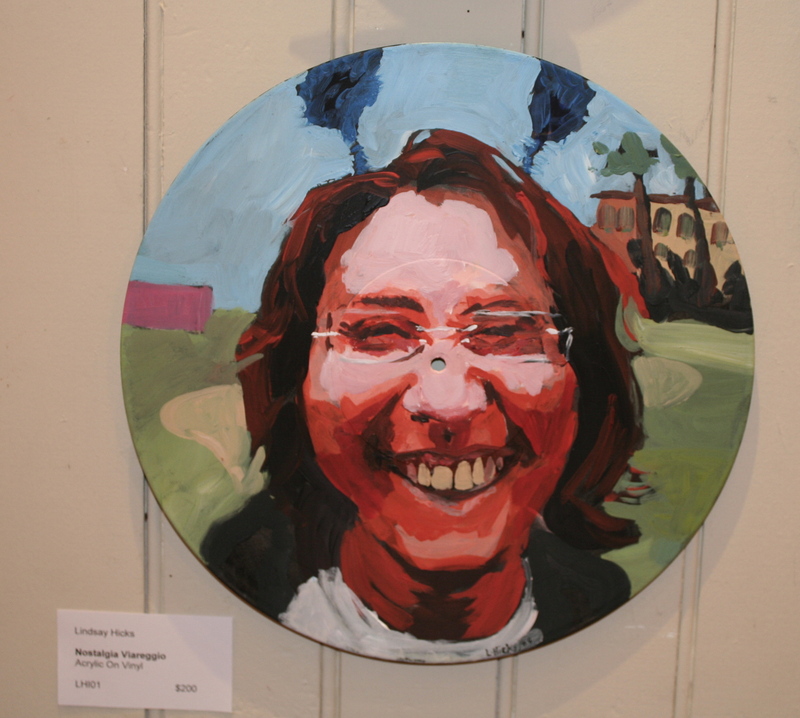 The lady working at the gallery told us Blythe Church was about to be featured on Martha Stewart (or was it Oprah? ), so that should be a good break for them. While at the harbour we also toured the HMCS Sackville, the last remaining of a kind of ship called a Corvette that was used as a submarine bomber in the 2nd World War. Step used to be really interested in war machinery and military stuff when he was a kid, until he understood what terrible results that were got from using them, but he still has residual interest because whenever we saw anything of military historical interest he always gives it a good look. We went by Strange Adventures, the comic book store, and they had a good selection of stuff but sadly the staff had the poor social skills often associated with comic book sellers (and they weren’t even the owner—just the apprentice). 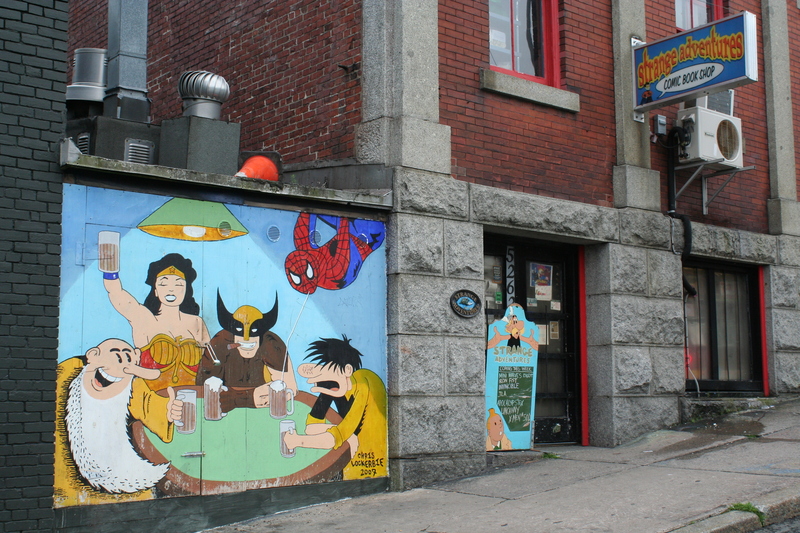 I wasn’t allowed to take pictures of the inside of the store, I guess in case I was planning to replicate the store exactly at a rival comic book store across the street, but I did take a picture of the awesome mural on the outside, featuring Buddy Bradley and Mr. Natural. To be honest, I still stealthily took pictures inside, but since I wasn’t allowed to I won’t post them here. I also bought a Big Book of Scandals because it’s gossipy, and took a free comic book day Simpson’s Comic because Ian Boothby wrote it. Then we visited the Propeller Brewery for Step’s supply of local microbrew (he can’t know his favourite until he tries every one), where Laura’s future husband works, and then it was time to roll out. In our trajectory was Lunenburg. 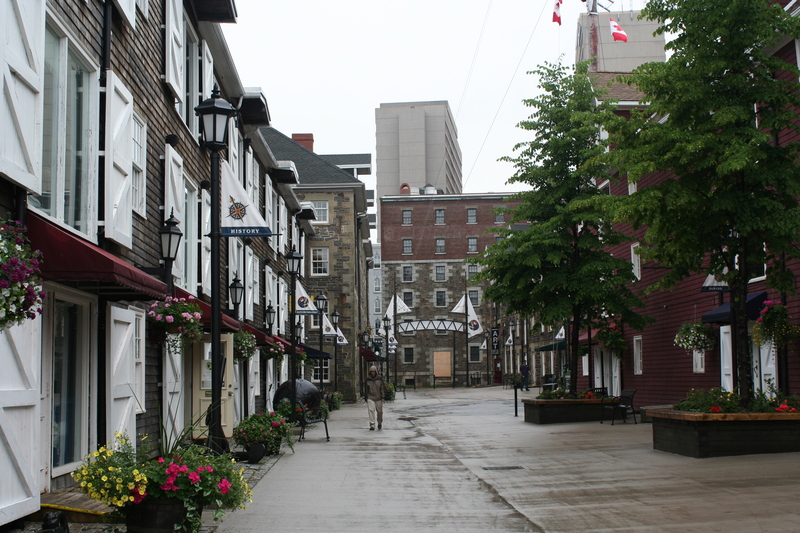 The British had this plan they used for towns they made, which was a grid with a few irregular features and many towns were built that way but Lunenburg is the only one still laid out that way, and most of her buildings still have their historical integrity. 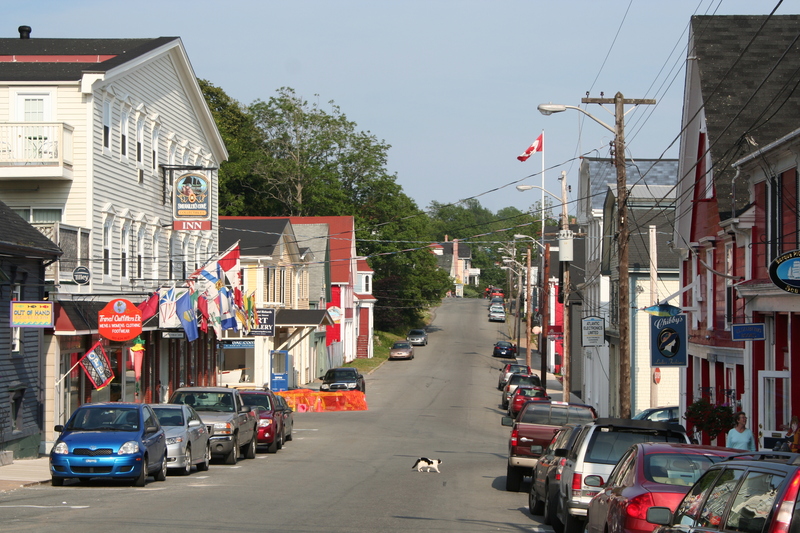 If you’ve ever heard of a “Lunenburg Bump”, it is a second story 5 sided bay window seen a lot in the town. 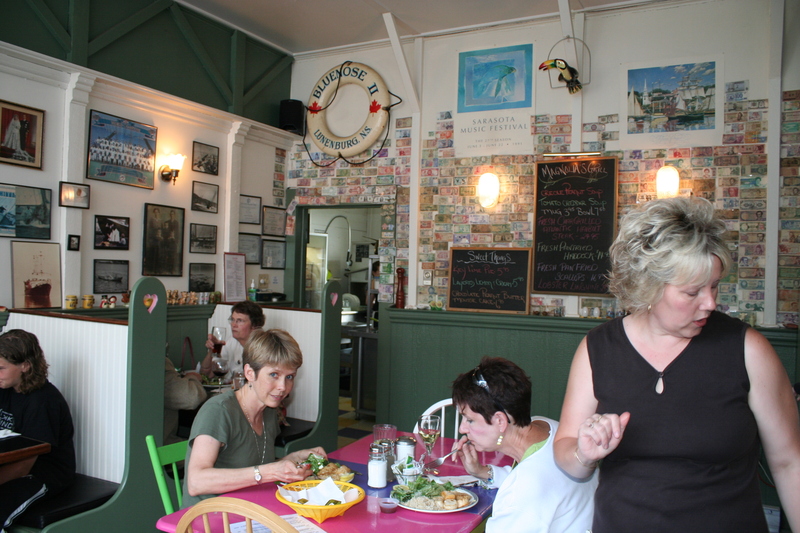 Lunenburg is also home of the famous Magnolia’s Grill. We had to wait around half an hour for a table but it was well worth it. Step had an appetizer of pickled herring, sour cream and crackers (surprisingly good!) and I had spicy peanut soup. Then Step had some pasta with mussels and I ordered the pan fried scallops with rhubarb chutney. I wouldn’t consider 10 gigantic scallops a normal or reasonable portion, but they were so good I managed to eat the whole thing. Too bad, because the desserts looked great, too. 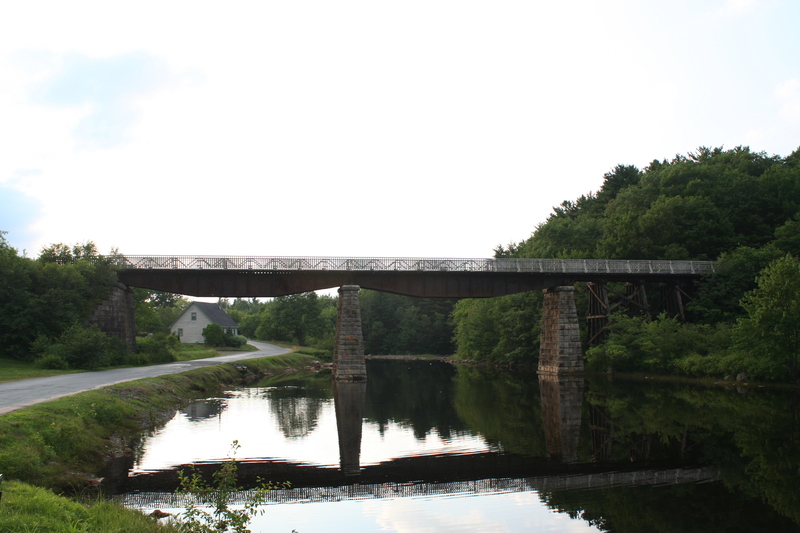 The drive from Lunenburg to Halifax is super-beautiful scenic, especially on a sunny summer’s evening. 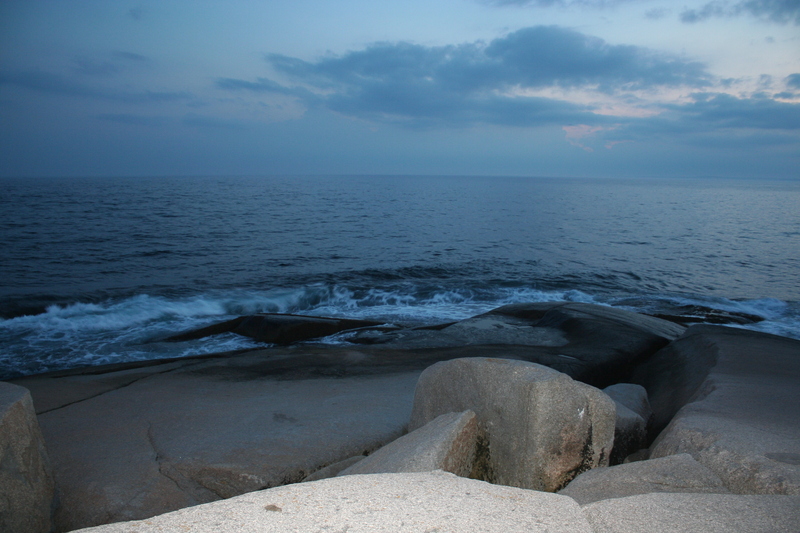 You really can’t go to Nova Scotia and not go to Peggy’s Cove. 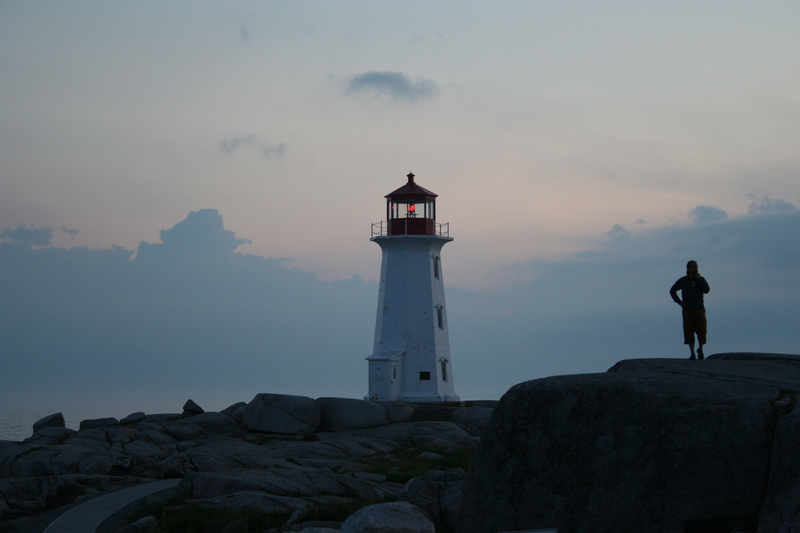 Peggy’s Cove is famous for it’s small picturesque fishing village and it’s extreme rocky but smooth shore with a lighthouse on it. At first I was a little disappointed we were getting there at twilight, but it turned out to be a rather magical time to see it, and many pictures were snapped by us. When it got so dark we had to leave we drove the remaining 45 minutes to Halifax.